Non-contact infra-red heat sensors measure plant stress by comparing temperature variances between ambient air & plant foliage. The model features: selectable ºC or ºF, LCD backlit display, temperature scan, 7-second display hold & maximum temperature display. Professional laser thermometer with advanced temperature processing; built-in socket accepts commercially available K-type thermocouple (not included). Note: The USDA has researched the stress level in plants as a function of temperature rise above ambient air temperature. 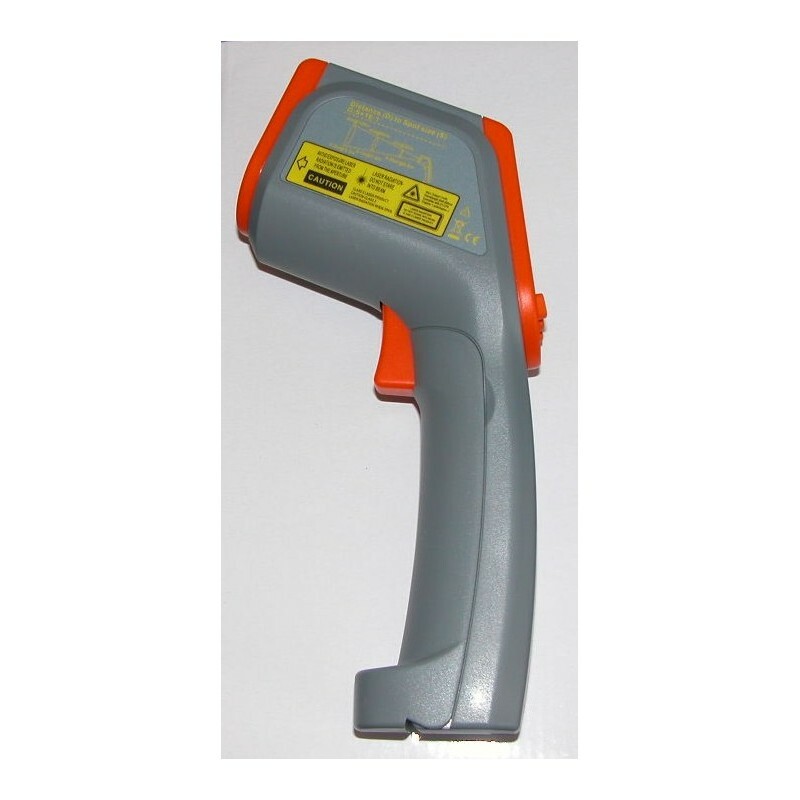 The IR gun provides a simple, fast and accurate means of testing the differential temperature (Δ T). The sensor has 16:1 distance to spot ratio. This means that the diameter of the "beam" cast on the leaf will be 1/16th of the distance from the sensor to the object. For example, if you stand 16 inches away from the leaf, the area being measured on the leaf surface would measure 1 inch in diameter. Other meters on the market have a distance to spot ratio of 4:1 or 6:1, which would require you to be very close to the plant in order to get an accurate reading of the foliage. You should avoid measuring any surrounding objects such as soil or the sky, which will lead to errors. Also remember that when you shine at an angle, the beam being cast will be oval, (similar to a flashlight beam). Point Infrared meter at center of 8.5" wide sheet of white paper. If you hold the sheet 24" from the IR meter, then the 3" diameter region will be providing the ambient temperature reading. Tree crops will transpire water slowly. Row crops transpire a greater amount. Overcast skies, clouds, and cold fronts cause I.R. plant stress to decrease. Early in the season, with small leaf area and shallow roots, stress will rise rapidly. Later in the season, large leaves and deeper roots will stabilize the stress factor. Stress may increase immediately after irrigation or soaking rain, especially in heavy soils. The lack of oxygen to the roots inhibits the ability of the plant to absorb water from the soil. In general, a differential temperature of +1or 2 degrees Celsius is very good (low crop stress). If the foliage is 10 °C warmer than ambient air, the plant is seriously stressed and cause of problem needs to be determined. Overall, the cooler a particular crop stays, the higher the yield and the better the quality of the crop. In order to produce maximum yield on seed crops, the plant stress should follow a sawtooth pattern over the course of the growing season. Start the season with low stress to promote plant growth. Then create stress in order to stimulate seed production. Thereafter, maintain the vigor of the crop in order to complete the production of seeds.